, in Latin Balduinus, a famous civilian, was born at Arras the first of January, 1520. He studied for six years in the university of Louvain, after | which he was some time at the court of Charles V. with the marquis de Bergue, and then he went to France, where he gained the friendship of the most learned men, and among others of Charles du Moulin, at whose house he lodged. The curiosity of knowing the most famous ministers induced him to travel into Germany; where he became acquainted with Calvin at Geneva, Bucer at Strasburgh, and others of the reformed clergy. 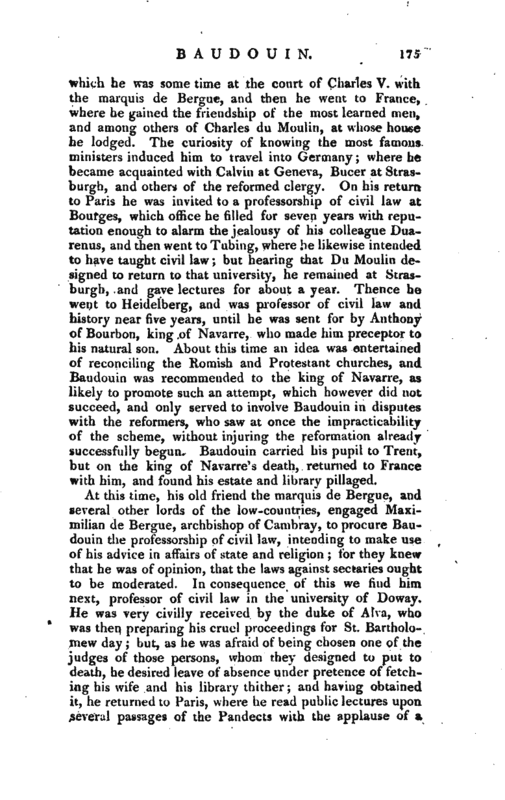 On his return to Paris he was invited to a professorship of civil law at Bourges, which office he filled for seven years with reputation enough to alarm the jealousy of his colleague Duarenus, and then went to Tubing, where he likewise intended to have taught civil law; but hearing that Du Moulin designed to return to that university, he remained at Strasburgh, and gave lectures for about a year. Thence he went to Heidelberg, and was professor of civil law and history near five years, until he was sent for by Anthony of Bourbon, king of Navarre, who made him preceptor to his natural son. About this time an idea was entertained of reconciling the Romish and Protestant churches, and Baudouin was recommended to the king of Navarre, as likely to promote such an attempt, which however did not succeed, and only served to involve Baudouin in disputes with the reformers, who saw at once the impracticability of the scheme, without injuring the reformation already successfully begun. 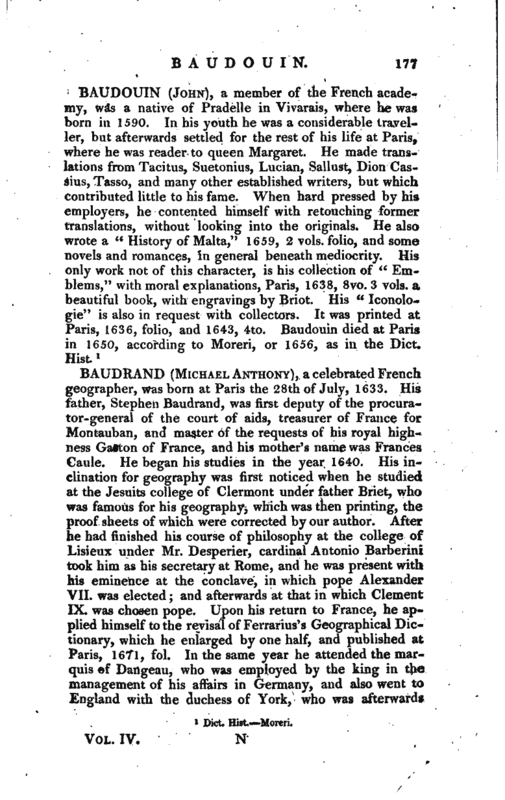 Baudouin carried his pupil to Trent, but on the king of Navarre’s death, returned to France with him, and found his estate and library pillaged. At this time, his old friend the marquis de Bergue, and several other lords of the low-countries, engaged Maximilian de Bergue, archbishop of Cambray, to procure Baudouin the professorship of civil law, intending to make use of his advice in affairs of state and religion; for they knevr that he was of opinion, that the laws against sectaries ought to be moderated. In consequence of this we find him next, professor of civil law m the university of Doway. He was very civilly received by the duke of Alva, who was then preparing his cruel proceedings for St. Bartholomew day; but, as he was afraid of being chosen one of the judges of those persons, whom they designed to put to death, he desired leave of absence under pretence of fetching his wife and his library thither; and having obtained it, he returned to Paris, where he read public lectures upon several passages of the Pandects with the applause of a | large audience. He accepted the professorship of civrl law, which was offered him by the university of Bezancon; but understanding upon his going thither that the emperor had prohibited that university from erecting this pro-‘ fessorship, he refused to read any lectures, though he was solicited to it. He then returned to Paris, and agreeably to the advice of Philip de Hurault, which was to teach civil law in the university of Angers, he went thither, where he continued his lectures for four years, till the duke of Anjou, who was proclaimed king of Poland, sent for him to Paris at the time when the embassy from Poland was received there. 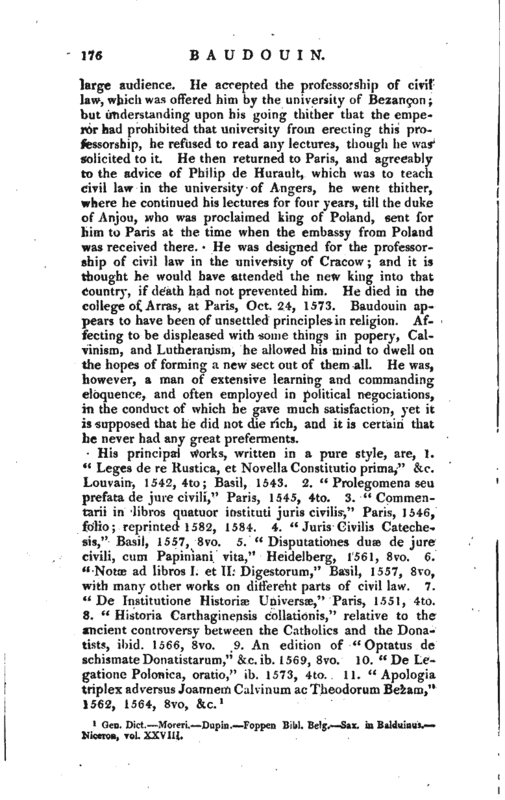 He was designed for the professorship of civil law in the university of Cracow; and it is thought he would have attended the new king into that country, if death had not prevented him. He died in the college of Arras, at Paris, Oct. 24, 1573. 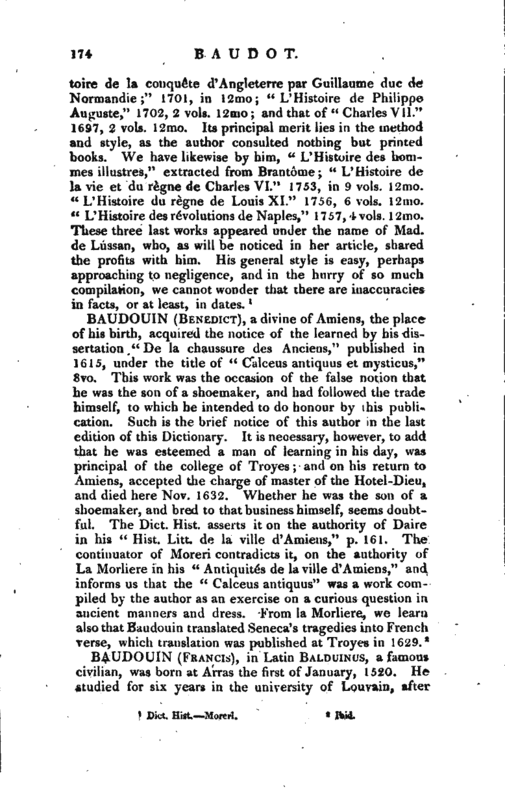 Baudouin appears to have been of unsettled principles in religion. Affecting to be displeased with some things in popery, Calvinism, and Lutheranism, he allowed his mind to dwell on the hopes of forming a new sect out of them all. He was, however, a man of extensive learning and commanding eloquence, and often employed in political negociations, in the conduct of which he gave much satisfaction, yet it is supposed that he did not die rich, and it is certain that he never had any great preferments. Gen. Dict. —Moreri. Dupin. —Foppen Bibl. Belg. Sax, in Balduinus. —Niceron, vol. XXV III.